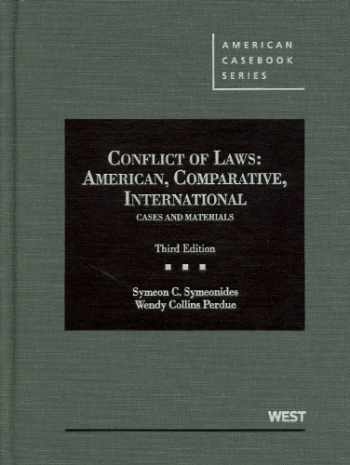 Acknowledged author Symeon Symeonides wrote Conflict of Laws: American, Comparative, International Cases and Materials, 3d (American Casebook Series) comprising 1152 pages back in 2012. Textbook and etextbook are published under ISBN 0314280227 and 9780314280220. Since then Conflict of Laws: American, Comparative, International Cases and Materials, 3d (American Casebook Series) textbook was available to sell back to BooksRun online for the top buyback price of $67.64 or rent at the marketplace. This versatile and pedagogically effective book brings together, in a coordinated way, the rich, diverse perspectives and 66 years combined teaching experience of two highly respected conflicts scholars: the author of 25 annual surveys of choice-of-law cases and drafter of three conflicts codifications, and the author of a path-breaking, established casebook on civil procedure. The book presents the real world of conflict law, behind the leading cases and beyond America's borders, through distilled documentation of what courts actually do and strategically placed extensive information about international practice and the law other countries.